Star Trek @ 50 Thirteen films, TV spin-offs, millions of loyal fans and the ultimate of accolades for any work of science fiction – spoofs. Confirmation indeed of Star Trek's status as a cultural force. Fifty years ago this week, the genesis of that legacy played to unsuspecting and uninitiated US viewers. Star Trek the original TV series aired with The Man Trap. It shouldn’t have been this way. By all rights, we shouldn’t be remembering Star Trek at all. Commercially, while the films have made money they haven’t been roaring successes – raking in $2.4bn in the US, adjusted for inflation, compared to $5.9bn for Star Wars – that other great totem in the sci-fi canon that nerds will retreat to. The most successful Star Trek film of all time, JJ Abrams’ 2009 reboot, made less than the least successful entry from Star Wars – $299m versus $450m. In an industry like Hollywood, driven by profit, the numbers don’t add up. And while you’ll hear some pretty lofty assertions made about Star Trek this week, it’s not like Star Trek was blessed by manifest destiny. Star Trek debuted not on the big screen, like Star Wars, but rather on the tiny living-room screen on US network NBC in September 1966. Just another TV show on just another US TV channel. Neither did NBC really care for any pretensions to dramatic excellence or making of statements on the nature of the human condition that might have been felt by the series’ creator Eugene Wesley Roddenberry, which have been accorded to Star Trek since then. No, NBC’s needs were simple: something to fill the slot against rival CBS’s Lost in Space. Box ticked. Star Trek’s writers weren’t exactly showered with gold either. This was TV and they only got a lot tighter once Desilu Studio, which produced Star Trek, came under the control of the Gulf+Western bean counters in a 1967 acquisition. Each episode cost $186,000 – versus $1.3m for Next Generation – and special effects were primitive. That’s why so many alien worlds looked remarkably like outdoors California or a version of the Blue Peter set, with coloured backdrop and Styrofoam rocks. 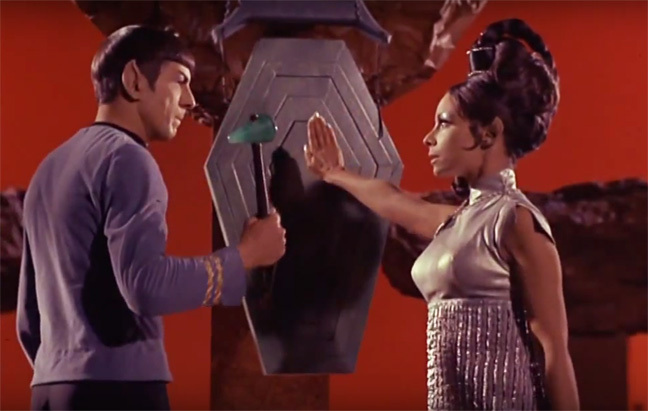 NBC treated Star Trek and Roddenberry accordingly: nearly axing Star Trek after two years, then killing it properly three years later in 1969 because of falling audiences. Moreover, Roddenberry nearly blew it, having to write a second pilot after the first, The Cage, was deemed “too cerebral” by NBC’s suits. Such was NBC’s desire to take on Lost In Space and to do business with the owner of Desilu – US TV sitcom hit star Lucille Ball (of CBS’s I Love Lucy) – that NBC was somewhat remarkably persuaded to give Roddenberry a rare second bite at the cherry in the dog-eat-dog world of Hollywood, producing Where No Man Has Gone Before that hit the mark. The original TV series lost the TV war, and nearly the battle for the cultural consciousness 10 years later with the explosive début that was Star Wars. And yet, we are here: just two months after that third film in the JJ Abrams reboot of Star Trek – the third after things petered out in 2002 with Nemesis – talking about the 50th anniversary of what in reality was a low-budget, late 1960s, TV time-slot filler. You could say Star Trek’s always been a bit of a survivor. NBC was ready to axe its space drama after the first series and into the second. What’s said to have saved it was a grass-roots protest from fans – loyal nerd fans, the most dogmatic and determined fans on the spectrum. Students at brain-box institute MIT in 1968 staged protests – this was 1968 after all. The network was also inundated by thousands of letters from students at CalTech and staff at former Nazi rocket man Werner Von Braun’s White Sands Missile Range, calling for Star Trek to be saved. It’s said Roddenberry orchestrated the campaign – an act that finally and fatally put him at odds with NBC’s suits and led to the ultimate demise of his TV show. Roddenberry claimed that 100,000 letters came in support of Star Trek, but others reckon the figure was more like 12,000. Whatever the numbers and the antecedence, this was an unprecedented outpouring of mail for a US network in post-War America. At the end of the second series in March 1968, the NBC announcer told fans their programme had been renewed for a third season. Herein would seem to lie the strength of that original TV series and of Star Trek. 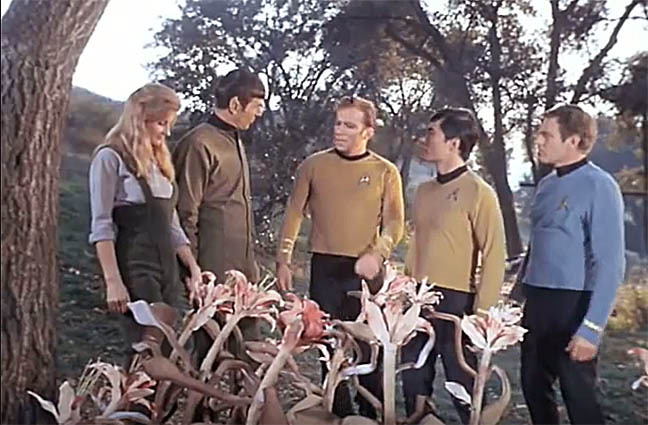 On paper, Star Trek cast were nothing out of the ordinary – more players in the meat grinder of Hollywood US network TV system. Roddenberry came to writing for TV having worked for the Los Angeles Police Department, where he’d been a consultant on the then-TV-hit Dragnet. His cast and writers were faces familiar in TV westerns and suspense such as The Outer Limits. But what Roddenberry demonstrated early on was willingness and a determination to paint complicated topics on an allegorical canvas. It’s this that made Star Trek not just stand out, but build a distinct and loyal audience. An audience you couldn’t ignore. Roddenberry's pre-Star Trek series The Lieutenant, a personal drama based around the character of Lt William Tiberius Rice and his unit of US marines, presaged some of the themes explored in ST. Only The Lieutenant's marines were not operating on the battlefield – not with the Vietnam War heating up. Their theatre of conflict was peacetime, with officers dealing with life challenges and their personal demons. The Lieutenant ran for 29 episodes between September 1963 and April 1964 and set the template for Star Trek: drama over action. The series was cancelled by a network – NBC – unhappy with, yes, ratings and concerned by external events – that war in Vietnam. The template for Star Trek is one of discovery, adventure and action. You can see the influences of submarine warfare and even WWII. The Enterprise is a ship referred to, naturally, as a “she,” while Kirk keeps a captain’s log. It’s worth recalling that Star Trek aired just 20 years after the end of the Second World War, with Roddenberry himself having served on a B17 Flying Fortress with 394 Bombing Squadron on 89 missions over the Pacific. For US TV and film in those post-war years, WWII was its strongest influence since the Wild West and men with guns took on men of the law. However, there were deeper influences, too, from Roddenberry’s childhood. Born in 1921, he’d grown up watching the legendarily camp Flash Gordon at the cinema during the 1930s, replete with its phallic rocket ships spitting smoke and sparks. The growing lad read what’s come to be recognized as ground breaking literary works: Edgar Rice Burroughs’ John Carter of Mars, said to have also influenced Ray Bradbury and astronomer Carl Sagan, and EE Doc Smith’s Skylark, a ground-breaking epic series of stories from 1928 that tackled the science of space and space travel. But there were even older and more classical currents feeding into that TV programme.